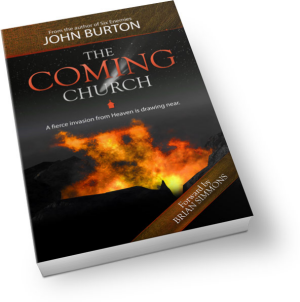 I’m currently writing my next book titled The Coming Church, and I am continually stricken by fear and trembling as I communicate what is about to hit. The coming fire will be consuming everything that is outside of God’s design. The coming church will look so different than the church of today that we will find ourselves speechless. Everything man-made is going. Everything that God deems good but outdated is going. The coming church will be a defined by fire and it will repel the lukewarm and religious—as it draws in the hungry and desperate. I continually hear people eagerly declaring that they are done with church as usual. Their heart is for God to move in and explode in power. I count myself as one of those people. However, the shift necessary to see this happen will upset what has been setup, and that price may be too costly for most. Consider the radical differences between the United States Marines and a spa. Today, the church structurally has the makeup of a spa that is setup to draw people in via programs and promises of personal attention. The coming church will function like a military that is setup to draw people in compelled by the magnitude of the mission. They will not show up to be served by to serve. People join a spa to be nurtured and enjoy life with themselves in mind. People join the military to serve unto death with others in mind. After 22+ years of ministry my opinion is that one of the weakest links in the church today is false expectations—expectations perpetuated by leaders who want to fill the pews. Let me explain. In the local church context today, most want to connect in the place that will meet their expectations. There is a predetermined set of expectations that people enter the church with, and If those expectations aren’t met, negativity creeps into the camp. So, today, people won’t continue in a church if it doesn’t offer what they want, and pastors can’t imagine the thought of losing them, so they adjust course and focus on giving them what they expect. In the Western church, the pastoral office is the natural office to lead a church that’s fueled by people’s need for nurture. After all, it’s presumed that pastors, by design, are the ones to meet the expectations of the people. They have the heart to do so. Therefore, pastoral leadership is widely embraced by those who are more inclined to receive than to give. Does that sound like American culture? Does a consumer mentality have its touch on most every area of our lives? Absolutely, and, it has nearly overtaken the church, and we as leaders have left that problem largely unresolved. What happens now is that pastors are overwhelmed with connecting with people, feeding them what they prefer and ensuring they are attended to—and that has compromised the strength and outward mission of the church. Now, of course, helping people is absolutely appropriate and necessary, and pastors are the ones best equipped by God to do that, but this ministry was never meant to be the primary function of the church! 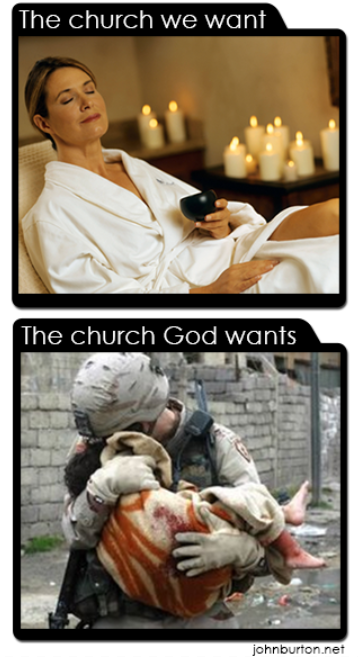 Today, churches act much like hospitals. Their key function is to deal with the wounded. In reality, they should look more like MASH units! Soldiers who are wounded in the mission are quickly stitched up so they can get back to the war! The nurturing, equipping process is important, but it is not the goal! Notice that the equipping is for a reason! To work! Additionally, we have every opportunity and responsibility to feed ourselves instead of relying fully on the church. Today there are countless teachings online, in books, on CD’s and more. There is no excuse for any of us to rely on anybody else for our nourishment. We should not be showing up to the church empty waiting to be fed. We should arrive full and overflowing with the richness of the Word that we have fed ourselves with that week! As an prophetic apostle, my focus is over the horizon. It’s on just a few narrow topics. I need everybody on their face praying, and I’ll do everything I can to teach them how. I want everybody going after regional revival, and I’ll teach week after week on how they can do that. I prophetically have a pulse on the church and I’ll constantly relay that information to the church so they can respond. But, they will have to take it upon themselves to learn most everything else. Of course, I’m not the only teacher in my context either. Others can and do impart knowledge and revelation, but it is still limited and it’s still required that we devour the Word ourselves. Today, pastor led churches nurture and feed as the goal so much of the time without casting the vision that they are about to call everybody to pick up their weaponry and move out to battle! The coming shift will result in less feeding and a higher bar of committed and focused response. The problem? Pastors are not the ones best gifted or called to lead this transition. The pastor led church is functionally compromised. Simply stated, the church is out of biblical order. Prophets announce, among other things, the coming governmental order and apostles bring the order. 1 Corinthians 12:27-28 (ESV) 27 Now you are the body of Christ and individually members of it. 28 And God has appointed in the church first apostles, second prophets, third teachers, then miracles, then gifts of healing, helping, administrating, and various kinds of tongues. These offices are listed in order of importance and function in the church. Life Application Commentary: Paul specifically ranked them as first, second, and third to show their prime importance above all the other gifts. ESV Study Bible: First… second… third… then seems to be a ranking of importance or benefit to the church, with apostles being primary and then prophecy and teaching also contributing greatly to building others up. The apostolic ministry is actually the first one that our Lord, Jesus, established in the New Testament church. Lk 6:13 And when it was day, he called unto him his disciples: and of them he chose twelve, whom also he named apostles. Why did Jesus establish the apostolic ministry first? Because it was to be the foundation of the church government in the New Testament, as the priesthood was the foundation of the ministry in the Old Testament. So, without apostles in the ministry, the ministry gifts are literally without the necessary foundation. Eph 2:20 And (you) are built upon the foundation of the apostles and prophets, Jesus Christ himself being the chief corner stone. There are governmental levels in spiritual realms. These are called “principalities, powers and rulers.” Each has a different realm of authority, a different authority level, and a different manner of operation. Eph:6:12 For we wrestle not against flesh and blood, but against principalities, against powers, against the rulers of the darkness of this world, against spiritual wickedness in high places. Likewise, we have different levels of authority in the different ministry gifts. Here is where the apostle’s authority is truly needed. At times, a pastor is confronted with different types of spiritual attacks. Without the spiritual covering of an apostle, he can be battling against powers and rulers that he is not actually anointed, or prepared to battle against. With the apostolic covering, he is able to draw upon the apostle’s anointing, understanding, and experience in these battles. Instead of fighting alone, he has the spiritual support he needs. The current structure or model of church ministry revolves around the pastoral paradigm (model) of ministry. A paradigm is a structure of ministry that serves as a model or pattern. It’s astonishing but the word pastor, Greek poimen is only mentioned once in the entire New Testament. From one occurrence in scripture we have built thousands of pastoral churches. Yet there were no churches ever built in the New Testament by pastors. Even the one started at Antioch soon received Barnabas as an apostolic leader. Barnabas was a sent-one (apostolic gift) from the church in Jerusalem. In reality we have created a structure of church services that is designed to bless, nurture and comfort attendees. After all, that is the dominate grace on the pastoral ascension gift to comfort, bless, nurture, protect and lead to still waters. There is nothing wrong with being a pastor. What we are discussing is the transition into an apostolic model of ministry that enables us to be more effective in establishing and advancing the Kingdom of God. Let’s face it the pastoral-only model of ministry is not working. We need something that is more effective and that’s going to be the apostolic model of ministry that we are experiencing today, the new apostolic prophetic church. There will always be a set man over a congregation. Scripture says, “Let the Lord the God of the spirits of all flesh, set a man over the congregation” (Numbers 27:16). Apostolic ministry models may have a plurality of leadership gifts working together to equip believers known as a presbytery but there will always be one set man that is ultimately responsible before God to apostle a church. The Holy Spirit is going to restore an effective structure of ministry that will empower you to raise-up strong sons and daughters in the Lord that will take the battle out of the church and into the city. Apostolic ministry gifts are spiritual master builders that carry the revelation of Christ governing Church. As Paul said, “According to the grace of God which is given unto me, as a wise master builder, I have laid the foundation, and another buildeth thereon. But let every man take heed how he buildeth thereupon” (1 Corinthians 3:10). The church is not a house of teaching or a house of evangelism or a house of friendships. The very purpose of the church is prayer! It is a house of prayer for all nations! If someone in the church is resistant to the call to pray corporately, they can’t consider themselves to be a functional part of the church. In today’s church very few live a lifestyle of prayer. In fact, most pastors don’t either! Leonard Ravenhill said: Pastors who don’t pray two hours a day aren’t worth a dime a dozen! We are in a Mark 11:15-18 season in our nation. In that situation, the people were using the church for personal gain. They had expectations of personal benefit. They entered the church with the expectation of leeching off of it, of using it, and leaving with more than they entered with. This is a defilement of the church! The call is to go into the church with the expectation of leaving with less than we enter with! We bring an offering, a sacrifice! We minister to God! This is critical! Pastor led churches more easily seek to give people what they expect out of the church. Now, please understand me. Pastors are God ordained! But, when they function outside of their appropriate governmental position, it brings disorder. The same would be true of any of the offices. You probably don’t want a prophet trying to nurture people! Thank God for pastors! In the coming church, everybody will pray as their primary ministry! Yes, everybody! This means a great offense is coming as suddenly those focused on their own expectations and who are resistant to the call to prayer will have nowhere to go! The governmental order in the church will require a mass exodus of uncommitted, unwilling hearts as intercession takes first place again. This type of dramatic shift requires the skills of an apostle to pull off. You might presume that intercession is to be reserved for the mature, for those who have graduated from the equipping process. No! No! No! The best equipping center is the prayer room! If an 18 year old pimple faced young person fresh out of high school with no experience, no knowledge, no wisdom can join the Marines and fight for our country, he can do the same in the prayer room! Again, there is a place for pastors to nurture people like this, and, in fact, we need pastors not as senior leaders, but as smaller group leaders who can invest time into individuals. They need to prepare them quickly to respond to the coming instructions from the apostles and prophets. It would make sense to have serving with an apostle maybe ten to twenty pastors for every one hundred people in a church. Islamic prayer: The second pillar of Islam is salat, the requirement to pray five times a day at fixed times. Children are often required to fulfill this daily requirement by the age of 7. If a mosque can be jam packed full of people praying early in the morning on a weekday as happens in our area, and if children as young as 7 are praying five times a day in that system, certainly an all consuming, Holy Spirit fueled life of prayer for a Christian is not hard to imagine at all! You are a priest, and that means that you have a job to do. You are a priestly intercessor before God and the call is to pray individually and corporately continually! In the coming church, under apostles and prophets, we all will show up and pray! That is church! Church services will be prayer meetings again! Personal expectations will be replaced by assignments to serve, give, pray and lay down our lives! We won’t show up with our prayer lists or our own issues but rather we will represent the nations as we invest into them in prayer. We are all priests and we all carry extreme authority! This is church at its best! The shift: Corporate leadership will shift from pastors to apostles and prophets primarily. Instead of merely relaying information, messages will be mostly challenging and directive with a clear expected response as the body is rallied to fulfill a corporate mission together. They will lead with the expectation that the entire unit will be moving in step with them as they fulfill the vision of the church in unity. The difficulty: Those that are averse to responding to prophetic instruction or who simply want a ‘pick me up’ each week to help them make it to the next Sunday will suddenly find themselves well outside of the vision of the church. There will be costly calls to serve, give, pray and function as a priest before the Lord, and that will be unappealing to many. The new aggressive, fast moving military will be challenging to say the least. The shift: In the coming church, pastors will mostly be relieved of primary church leadership responsibilities and will be released to spend most of their time one-on-one with people and in small groups. The difficulty: Pastors who are senior leaders will be asked to relinquish their positions, their salaries and their influence in favor of an apostle God is calling them to serve under. The shift: Many programs of the church will be eliminated, possibly including children’s ministry, youth ministry, drama, etc. and will be replaced by prayer meetings, training and outreach. The difficulty: People will have to change their expectations and make themselves ready to serve by growing intentionally on their own in a significant way each day. They probably won’t have close, direct access with the leader and will have to trade personal desire for close friendship for a readiness to respond to the sound of the alarm. The shift: Most services will look more like prayer meetings than anything else. Everybody will spend the bulk of the service ministering to God in intercession and community will surround that emphasis. The difficulty: The desire to be entertained and overfed will no longer be met. Mostly receiving will change to mostly giving. Rapid maturity will be required as apostolic leaders move ahead aggressively in a rapidly and ever changing culture of ministry to the nations. Those resistant to growth or to change won’t easily find a place to connect. Additionally, relational community will occur only around the mission. The prayer meeting will be the gathering point for friendships to develop. People looking for these types of connections will be disappointed if they aren’t willing to jump in the bunker in a risky mission with their fellow soldiers. Gladly, the pastors will be in the bunkers with them. The shift: Seeker churches will quickly fade away as the fire of the Holy Spirit rages in the houses of prayer. The lost won’t be relationally converted as much as they will be converted by fire. We will trust God’s wisdom as in Acts 2 and allow the fire of God impact a region. The prayer room will become the place of choice to bring the lost. The difficulty: Everybody will have to drop most everything and tend to the fire in the house of prayer. To ensure the atmosphere is supernaturally charged, everybody in the church will be spending hours a day in the prayer room together. False salvations will drop to near zero as they won’t be based on a simple prayer but rather on an encounter with the God of fire. It’s important that I do say that many current pastors are actually gifted with apostolic and/or prophetic offices. They will help lead the shift! We will all have to trust God as our personal finances, plans, dreams, influence and structures are threatened. God really does have plans to prosper us even in this dramatic, unsettling shift! However the gist of the writing I can really confirm and here is my confirmation. Below however is a query! You got a scripture for that John? Like for example "You have not many fathers s s s s s s........." I think you'll find you've just been listening to the traditions of man too long bro.